Your babies special day will be remembered and cherished forever with this heirloom baby girls gown. Vintage by design, this is a gown that your mother and grandmother could have worn. The magnificent detailing speak for itself. Trimming the peter pan collar, puffed sleeves and at the hem of this infant special occasion dress is delicate French lace. The gown bodice has a display of tiny, vertical pintuckss and the skirt has long soft pleats draping below and a floral embroidery pattern in white. 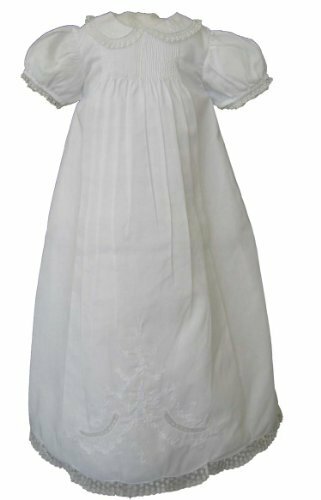 This lovely little girls white dress comes with slip and a matching infant baby bonnet; everything you need for the special occasion. If you have any questions about this product by Feltman Brothers, contact us by completing and submitting the form below. If you are looking for a specif part number, please include it with your message.